Eating Lighter – even with dessert! Place 1 cup ice in a 2-qt. pitcher. Add 1 cup beef broth, 1 cup vodka, 4 cups tomato juice (or V8), 2 tablespoons lemon juice, 2 tablespoons lime juice, 1 tablespoon green olive brine, 1 tablespoon Worcestershire sauce, 2 teaspoons prepared horseradish (more if desired), 1 teaspoon celery salt, 1 teaspoon ground black pepper and 1 teaspoon hot pepper sauce (such as Tabasco, Tampico, or Texas Pete’s); stir to combine. Serve over ice. 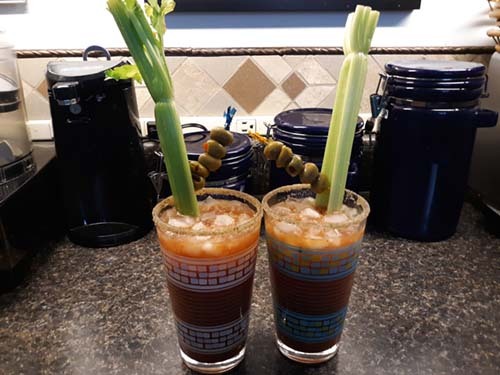 Garnish with celery stick and green olives. Serves 4.